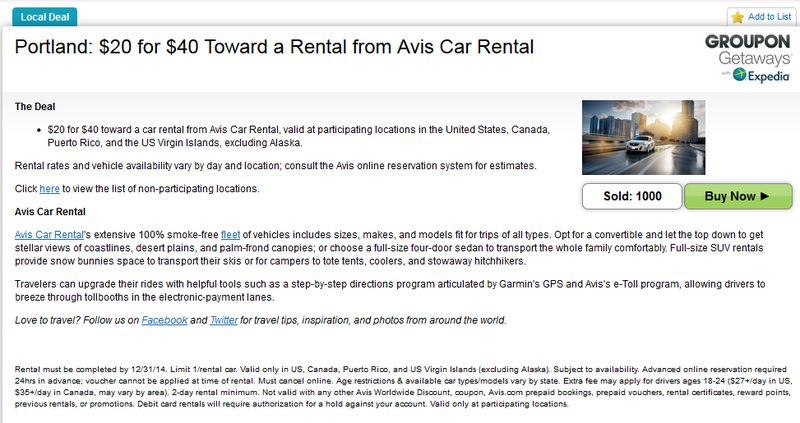 Super duper deal going on right now at Groupon, for $40 in credit for renting a car at Avis for only $20. The deal is good for participating locations across the U.S., Canada, and Puerto Rico. Excludes Alaska, but does include Hawaii! For even better value, access Groupon through the Ultimate Rewards Mall, if you have one of the Chase credit cards that participates in Ultimate Rewards, such as Freedom, Sapphire, Sapphire Preferred, or any of the INK series business cards, to get an extra 4x per dollar. The deal won’t last long, so if you are looking to rent a car on an upcoming vacation or road-trip during this Holiday season, jump on this deal now! Groupon is a great way to savings. Some of the deals are almost 50% off, if not more. I recently acquired a $10.00 Shell Gift Card for $3.00 from a targeted offer they sent me. My wife also got the offer, and I was quick to get it on her account as well. However, did you know you could subscribe also to the OTHER Groupon sites? On my last trip, we went to Singapore and Malaysia, and a few weeks before, I had subscribed to Groupon.my. 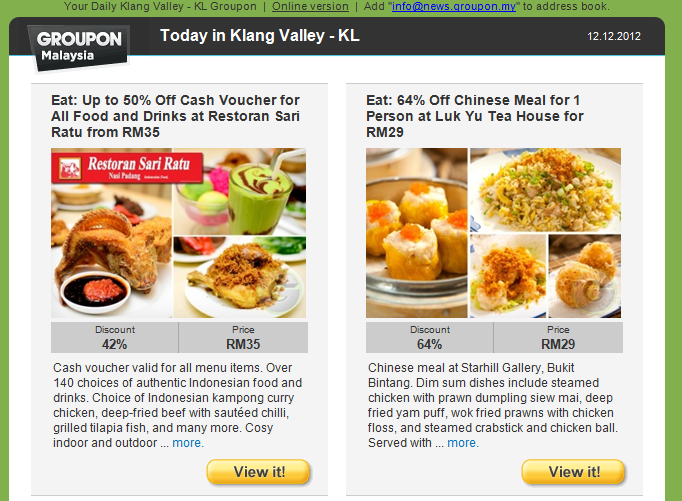 That’s the Groupon for Malaysia….and I started getting the local deals for Kuala Lumpur shortly in my inbox. The deals were, of course, in the local currency and let me tell you..there were some amazing deals to be had! That is just a couple of examples, that I took advantage of. There are tons of deals to be had. So here’s the tip…..a couple of months or a few weeks before departure, subscribe to a Groupon site of your destination, and see if you get any deals worth jumping into! Also, this doesn’t just apply to international sites. You can also apply to ANY of the cities in the U.S. For example, I have subscribed to Las Vegas and Los Angeles to see what kind of deals are happening there. I often go to Las Vegas to visit family, so saving money on dining, activities, and other things outside the strip is an added bonus.